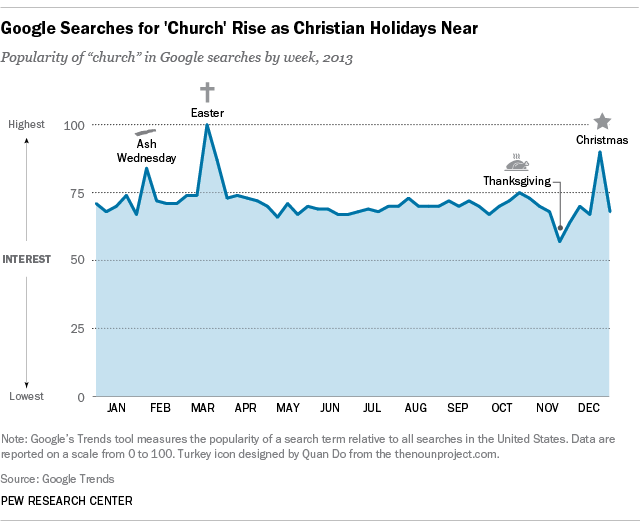 Priests and ministers have long noted a sharp increase in church attendance around the two most significant Christian holidays, Christmas and Easter. Some have given those who attend services only at those times of year a name — “Chreasters” — and churches have launched campaigns to get them to attend more regularly. 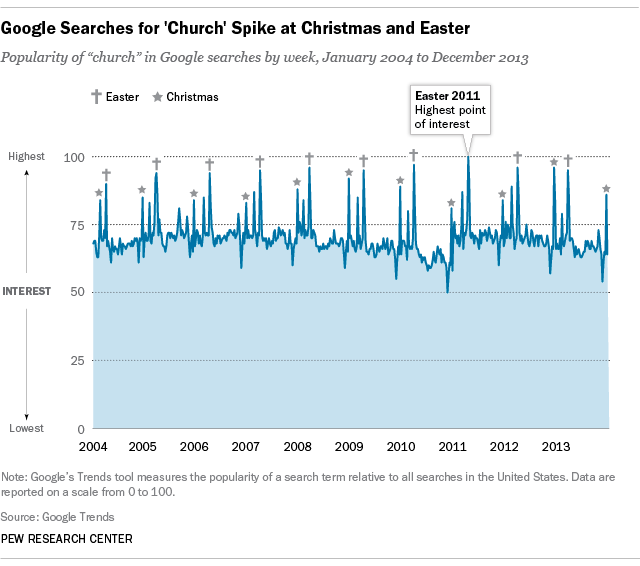 More Americans search for “church” around Easter than at any other time, with the Christmas season usually ranking second, according to Google Trends data between 2004 and 2013. Google’s Trends tool measures the popularity of a search term relative to all searches in the United States. Data are reported on a scale from 0 to 100. Easter is Christianity’s oldest and most important holiday, during which Christians celebrate Jesus’ Resurrection three days after he was crucified. In liturgical terms, Easter Sunday is a moveable feast. Its observance, which comes at the end of a 40-day period of penance, fasting and self-examination called Lent, changes within a range of time each spring. Between 2004 and 2013, Easter was in March three times and April seven times.